What happens when volcanoes erupt and why do earthquakes hit particular places? What was it like in Pompeii when Vesuvius exploded? How does a tsunami work?In Eyewitness Volcano and Earthquake, discover everything about volcanoes around the world - from the largest, such as Hawaii's Mauna Loa, to the most active, including Kilauea in Hawaii and Etna in Italy. Did you know that Indonesia has over 125 active volcanoes, and that there is one in Antarctica, too? Explore the hot spots of the world, including the Pacific Ring of Fire. What does an earthquake feel like? And how long does it last? Read all about the devastating earthquakes that have hit San Francisco, the stages of an earthquake, and how dogs can help to rescue people. Learn all about tectonic plates, what causes magma to escape from deep inside Earth, and how eruptions affect our climate. Find out what a volcanologist does, and how scientists can predict the timing and measure the magnitude of an earthquake. 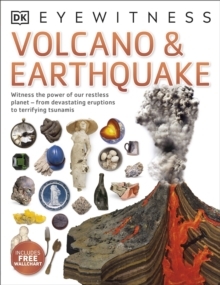 Eyewitness Volcano and Earthquake is packed with scary and fascinating facts and stunning photography and illustrations. A fact-filled wall chart adds extra educational value. Part of the best selling DK Eyewitness series, it is the perfect reference book for children.